With a Stamp and a Song: Rise and Shine! 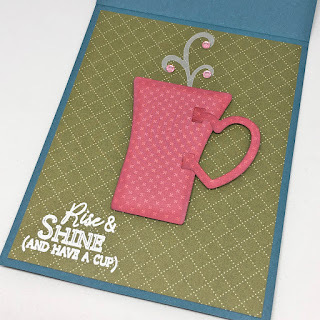 Stamp Simply just released a new Java stamp and die duo and it is SO adorable! Just look how darling that heart-shaped cup handle is! The die set includes another larger cup with a regular handle that will even double as a beer mug, and the set has the perfect accompanying sentiment! So much fun! This pretty girlie paper is part of Echo Park's Coffee designer paper pad. Some Thursday mornings my BFF and I go by Spring Coffee Shop to grab a cup as we head to St. Augustine for the Textiles Fiber Guild meeting, so I thought this feminine floral was an appropriate choice for today's project. There are more traditional coffee prints in the pad should you prefer to carry the theme a little further. 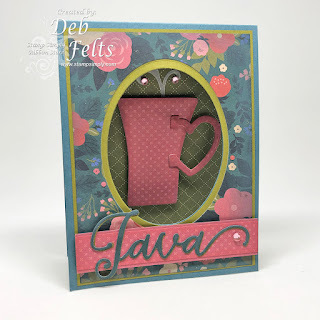 The Java die cut on the card front is cut from designer paper and card stock, one layer adhered with the other just barely peeking from under the other like a drop-shadow for just a little extra strength and dimension. The coffee cup peeks through the window that is cut through the front of the card, and when the card is open, the hidden sentiment is revealed. This card is relatively flat, so it would be easy to send through the mail.